← With tomorrow being Floral Design Day, I thought I’d turn to Real Simple to give us some techniques and ideas on floral arranging. 2. 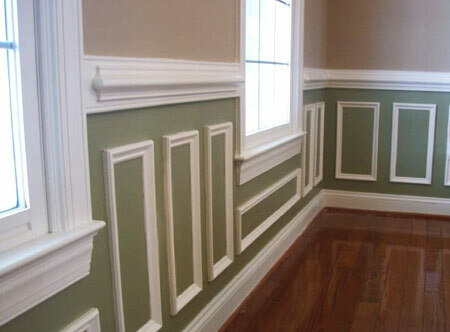 Trim: Buy your own trim, cut it to size and then use it to create a “picture frame” on a wall. You can fill this large “frame” with fabric, paint technique, family photos, etc. 4. Accessories: Find places in your area that sell inexpensive pottery and vases; Goodwill or consignment shops are a good place to start. As far as artwork goes, taking a black and white picture and framing it in a simple black frame is a great, fresh look. 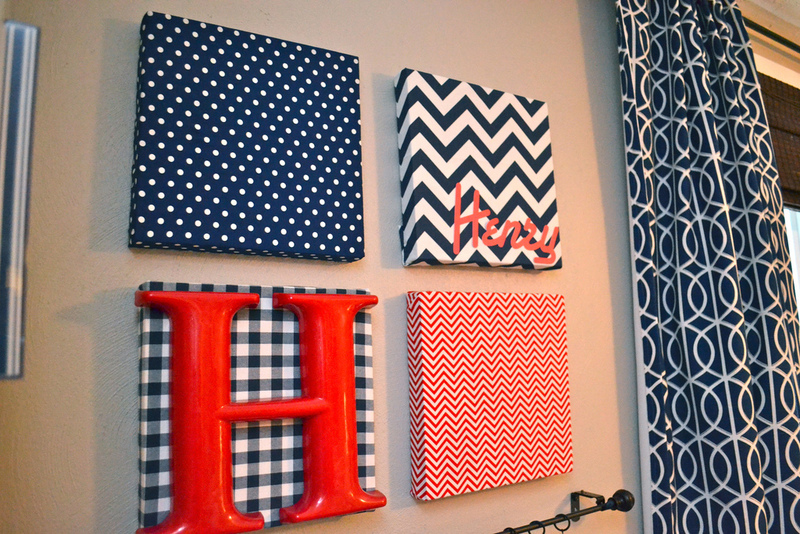 Another great, inexpensive idea is to go and get an art canvas, cover it with padding, and then cover it with a fabric you really like. All you have to do is staple the fabric to the back with a staple gun. I’d even encourage you to do your own abstract artwork on a canvas. Be creative and express yourself! 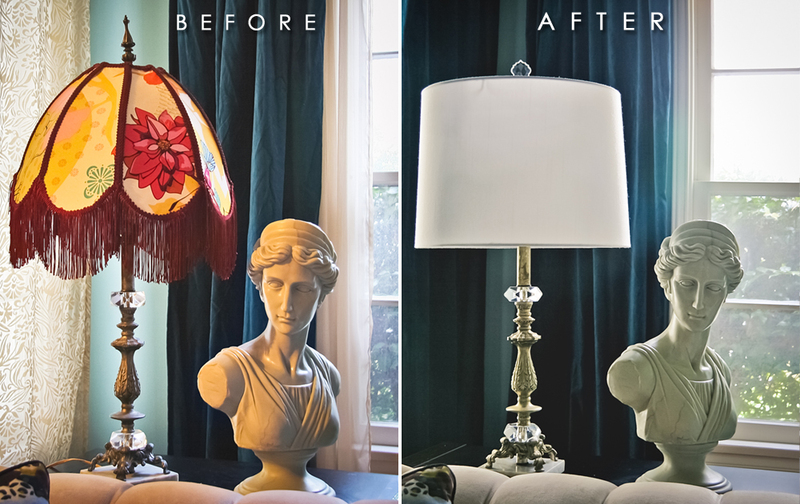 Changing an old lamp shade and finial out for new ones can really change the look of an old lamp. 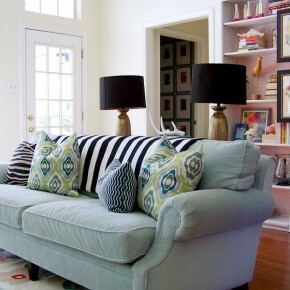 A few other ways to accessorize inexpensively are to use live plants, make and use your own wall-hung shelves for displaying accessories, find old trunks at thrift stores or garage sales, and use them as a coffee tables, and while you’re at it, find a few old used books for accessories on that coffee table. 5. Windows and Lighting: If you’re trying to save money on window treatments, buy inexpensive blinds or shades from Walmart, and only use a valance; this will save money on a lot of fabric. However, if you really want wooden blinds, only use them on the front of your home and buy plastic blinds for the back windows. You can use regular curtains for your shower curtain, but just make sure to buy a plain liner curtain. When thinking about the lighting in your home, go ahead and invest in dimmers; they can really change the feel of a room. 6. Upholstered Furniture: If your furniture is old or the wrong color, before buying new, consider buying an inexpensive slipcover. 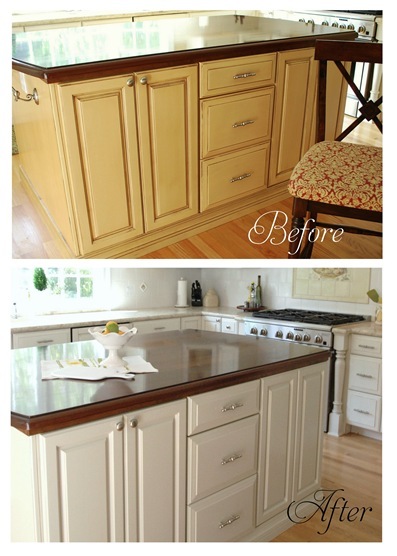 Keep in mind, you can very easily reupholster dining room chairs. 7. 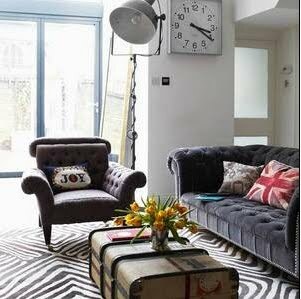 General Tips: Lastly, I’ve just got some tips for you… Save up and buy timeless, more neutral furniture. 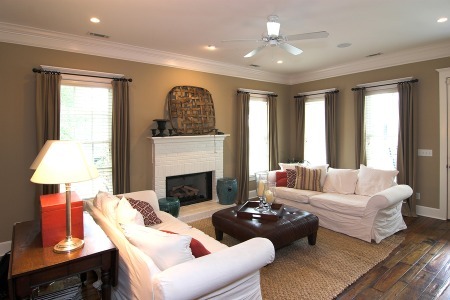 Remember that paint and curtains are generally less expensive to change than furniture. You can always ask for sales on the display pieces in furniture stores. Watching Home and Garden TV is a great way to learn more about inexpensive and creative ways to design. Don’t feel the need to immediately fill every space; wait and be patient for the right things. You’ll be happy you waited when you finally find the perfect sofa table. Determine what you want to invest in, and save up; quality will save money in the long run. If you get on mailing lists for decorating stores, (JCPenney’s, Bed, Bath, and Beyond, etc.) you’ll often get great coupons on a regular basis. Lastly, shopping Goodwill, consignment shops, and garage sales can really help you save money. Garage sales and estate sales in wealthier neighborhoods can have great deals on nice things. Are you aware of any web pages to purchase a unique nests of tables collection? I would try a company called MadeGoods. They have some creative, unique ones!